Problems, problems, problems...whatever they may be, most likely lots of problems surround you every day and create stress. Even if these are simple problems but you're bombarded with many of them, it can be enough to lead you to a serious physical or mental strain, and your health will suffer eventually. A patient was informed by his doctor that he was suffering from cancer. Since then, the patient began to worry many things such as his financial problems, work, and the state of his family. After five days of tremendous mental stress, he committed suicide. Although depression is described as a normal emotional reaction that can happen in everyday life, sometimes, a long-term strong feeling of anxiety can make you suffer and damage your brain mentally. Then, it may lead to physiological symptoms such as insomnia, palpitations, muscle spasms, sweating, hypertension, or cause serious life-threatening conditions like “Anxiety disorder”. We also know that there are some people who cannot leave their house without companion or helpers due to unknown stress or worries. Bungee jumping is a well-known thrill-seeking risky sports activity. Considering the risks that bungee jumpers are exposed, we tried to check and study their stress levels just before their jump. We recorded various data such as heart beat, breathing, and brain waves, while asking them about their worries in case accident happens. 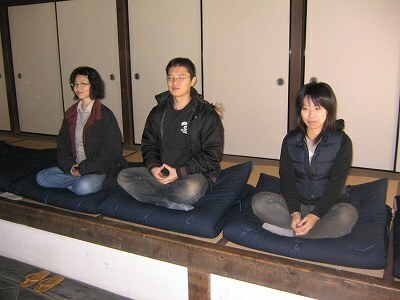 For some groups, we requested them to do certain types of meditation like Yoga or Zen (Zazen). We tried to see if these sorts of meditations can help eradicate their anxiety and bring down their stress levels. When you have worries or problems, you stress level changes depending on the degree of your anxiety, as we have concluded based on the brain wave tests. We found out that when you are in a state of anxiety, an inner part of the brain reacts and either becomes less active or completely stops functioning. We think that this function may be the key to stop stress or reduce anxiety. To prevent further increase of anxiety level in your brain, you really need to do some sort of trainings to reduce your stress buildup. The first thing that comes to our mind is something like that of Zazen (Zen Meditation). Zen meditation may be one of the best stress reduction techniques to calm your mind and reduce your stress. Yes, brain exercise of 15 minutes a day can be recommended for those who are facing such stressful situation. As evidenced from our interviews conducted with people practicing Zen meditation, we learned that those who performed Zen meditation for more than 30 days were able to sleep way easily, as opposed to those who did not. Imagine yourself resting while looking at the beautiful running stream of water. Then, picture a fallen leaf passing through the creek downwards. Now, focus and visualize placing your problem and worry to this small leaf. The concept of this meditation technique is that the leaf will carry your problem downwards until your eyes cannot reach it anymore. That is an example of Zen meditation! The above technique shows how Zen meditation can help in alleviating your stress. Repeat this process every now and then, at least 15 minutes a day for 30 days, until everything becomes normal. Ideally, we recommend that you meditate after taking a bath or shower, mainly because your mind and body will feel awake and fresh at that time. Once you succeed with the above training, you will feel like a king, and you will never worry or have problem with your surrounding just like me, hehehe. To tell you the truth, all members of the PYRO-ENERGEN groups are forced to do the above meditation every morning before they start working. No one in the PYRO-ENERGEN groups get worries and illnesses. Start doing it now and you can also live without any worries once you have gone through this Zen meditation training.